Happy first day of Winter!!! We were surprised to wake up yesterday to snow on the valley floor. But it didn't last long and we are hoping for more this weekend. I want a white Christmas!!! Anyways, I am coming at you with a little Christmas house tour. I took the pictures in the evening because, WORK, but I still wanted to share a little bit of my home. I didn't get the cute Christmas tree that is in my girls room as I keep forgetting until after they are asleep. But you can just imagine. Enjoy. Right when you walk in the front door, just to the left is this little set up. 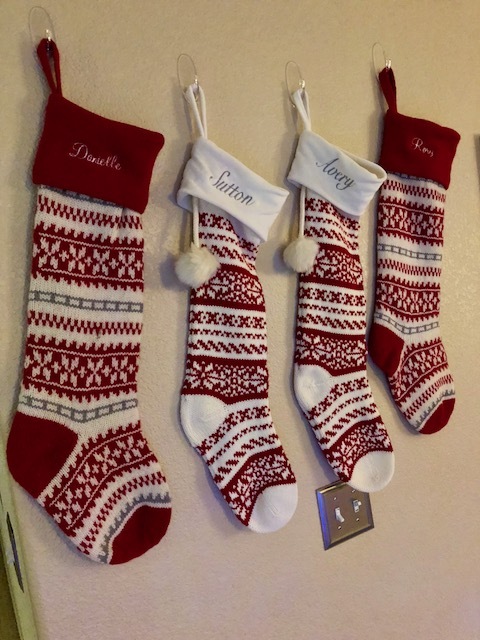 I usually hang Walter's stocking up with ours, but since we bought new Pottery Barn stockings for Rory and I, there isn't any room up there. So for now, it sits on a light. Ha. Notice the six Fall and Winter candles from Bath and Body Works? There is a ton more throughout my house. These are used all the time. 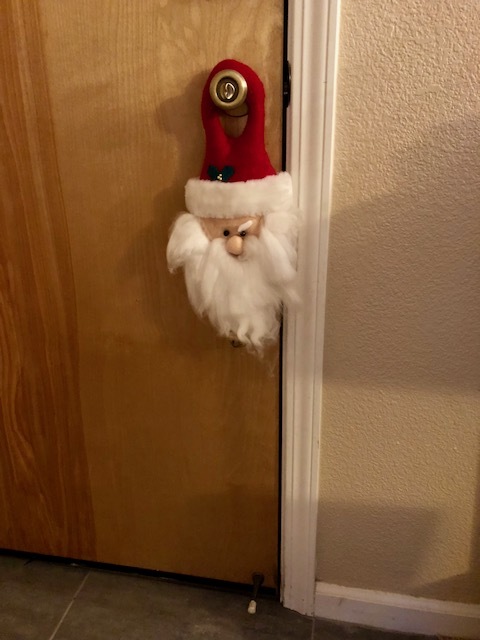 This little door hanger is from Rory's childhood. Walter has taken a bite or two out of his beard, but has left it alone in the last few years. We bought the girls their Pottery Barn stockings two years ago and decided to get semi-matching ones this year. 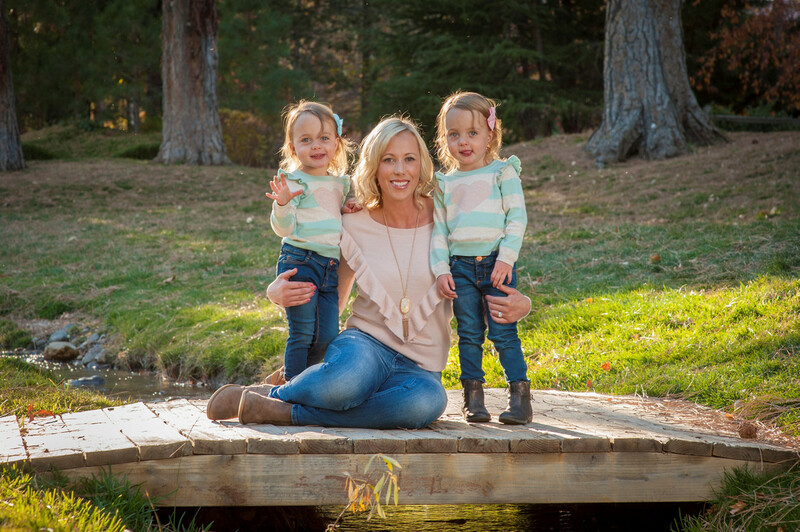 The problem with getting them two years apart? The stockings are bigger, the tops are different and the writing is smaller. But we are still overall happy with them. 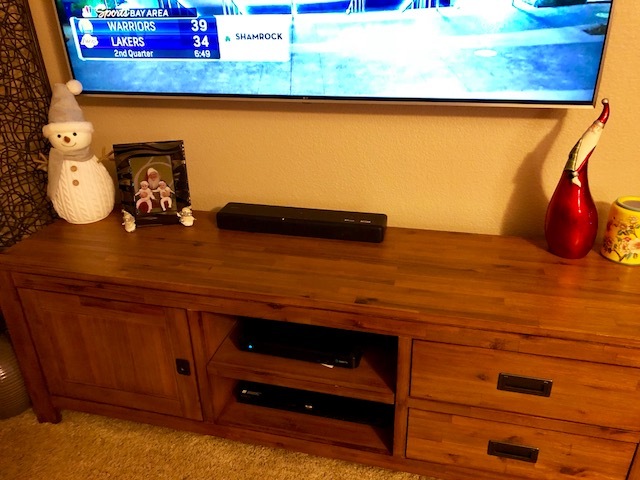 This is our entertainment center and we have added a few Christmas items that we have gotten over the years from Target, Pier One and small local shops. 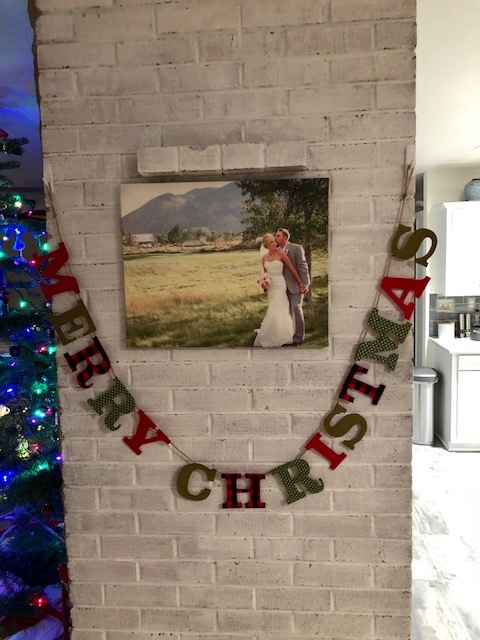 This Merry Christmas banner is new to us this year. My MIL got it and it fits here perfectly. 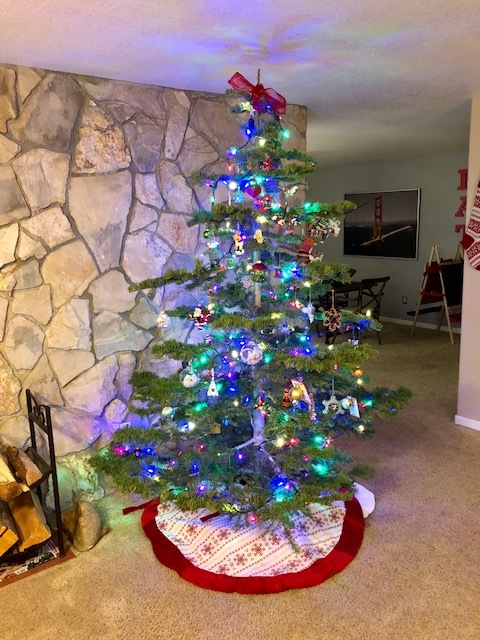 Our tree which I love, but hate that I couldn't find a tree topper for it. I just wish I had an angel or something to complete it. Right now we have a glittery bow which will do. 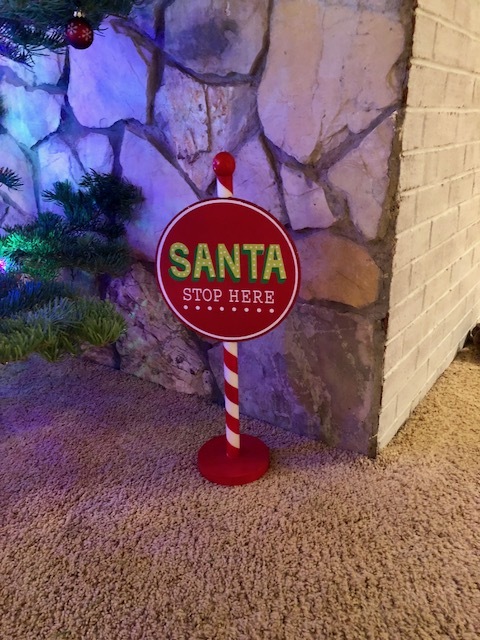 This Santa sign comes from Target and is the cutest. 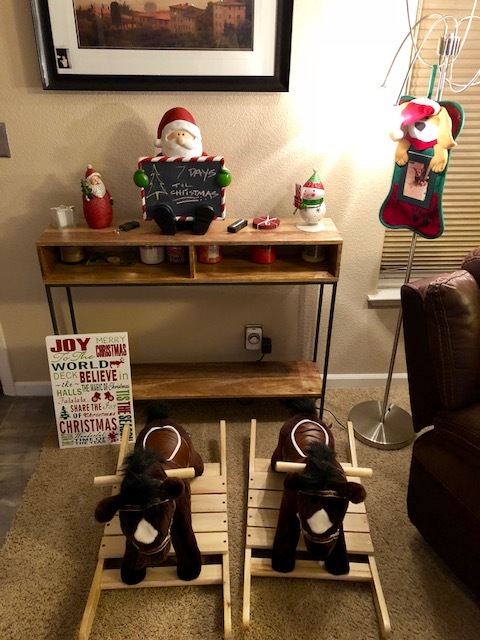 My mom got it for us last year. 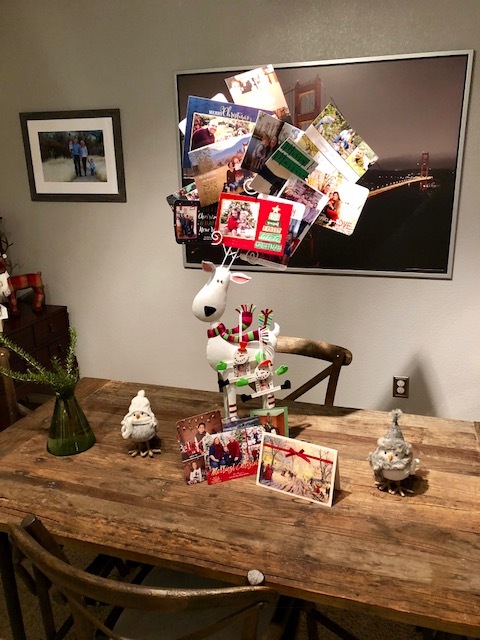 We feel so loved to receive so many Christmas cards using the cutest holder. Again, my mom got us this a few years ago. Funny story...I come home one evening from an appointment and Rory shows me a bunch of new cards. He said he didn't know who a bunch of them were, but were guessing they were my blogging friends. I told him they were and how amazing my friendships are with my blogging friends. He said it was awesome that I had developed friendships from this which I completely agree! So thank you my friends. 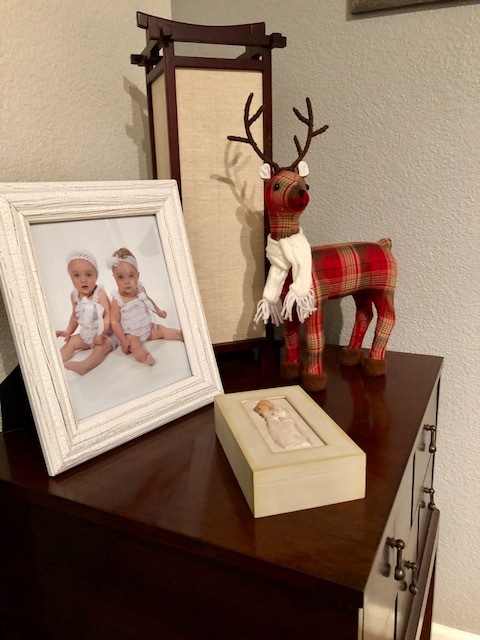 We got this little reindeer from Target a few years ago and he was even used as Giuseppe's "hiding" place. 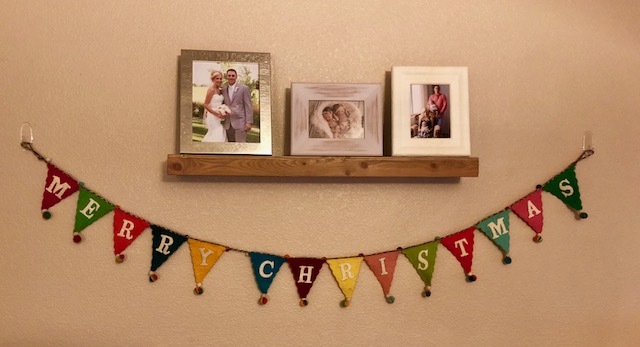 This is the cutest Merry Christmas banner from the dollar spot last year. Plus that is my favorite picture from my wedding day. 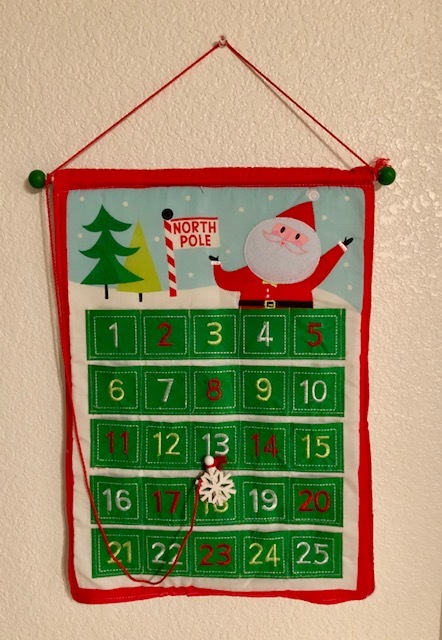 This little advent calendar is from....you guessed it, Target. As I said, there is some decorations in the girls room and many outside, but I forgot to capture those. Did you do a home tour post? I would love to see it. Looks very festive! Merry Christmas! Love all the decor! 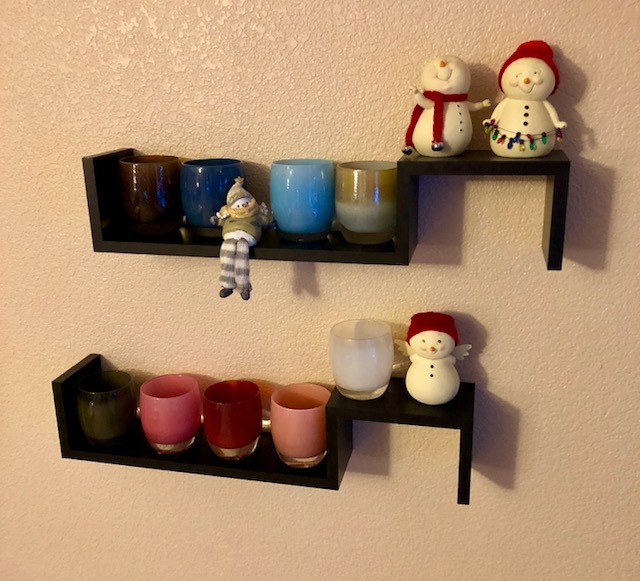 So cozy and festive! Your house looks so pretty and cozy! I love your tree. I think the bow topper looks great!